Karen L Messick Photography: Klots Throwing Mill Lonaconing, Md. Klots Throwing Mill Lonaconing, Md. Yesterday I had a last minute opportunity to make a run up to Lonaconing, Md. to the old silk mill. 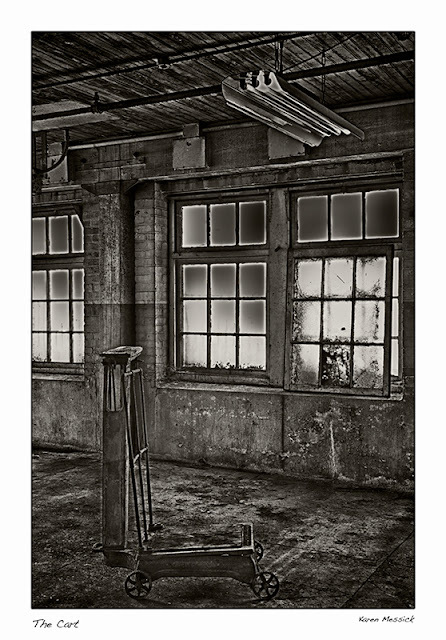 Last time I was there, I mainly shot on the second floor as it was a dark dreary day and the light was best. I was sick that day and only shot for three hours. Yesterday I started shooting on the second floor and later headed to the dank, dark basement. I went down with out my gear to observe the area, then after determining it was in better shape than my last trip and Herb the owner, had turned a few lights on I went back and got my gear and made some images. All the images on this blog are from the basement area of the building. (I will be posting more of the other floors as I get them processed and of course I will have a few iPhone shots on the other blog as well.) The basement served as the receiving, and shipping area of the plant when it functioned. There are wooden hampers used for moving the spools and materials from floor to floor still in tact. 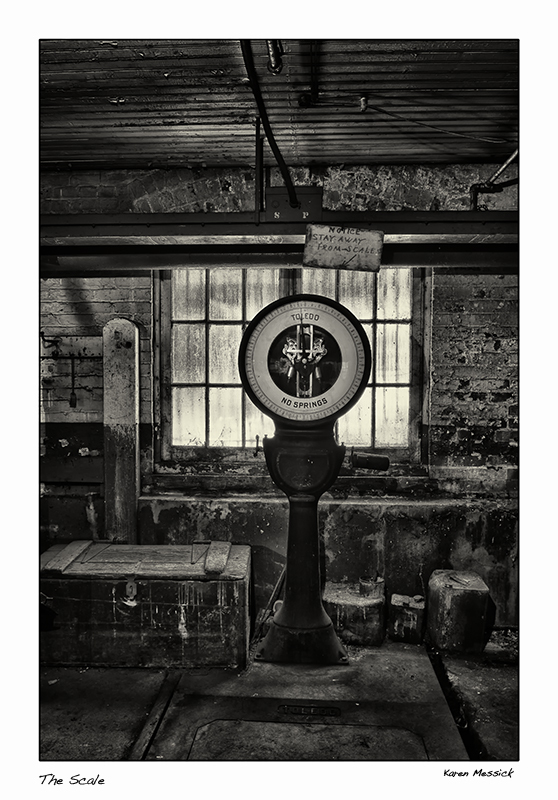 The large scale used for weighing in and out materials stands as it did in 1957 when the mill was closed. I enjoy researching the history of places like this and when I was researching this morning I found the death notice of the original owner of the mill, published in the New York Times in 1914 (actual notice inserted below). There are two spellings of the owners name I found when I was researching, but this is the correct one. I snapped a photo of a map that was hanging on a wall with my iPhone dated July 23, 1933 and the spelling was Klots. When I was in the basement I noticed some packaging materials had the name of General Silk Corporation. Seems the name was changed before it went out of business as the article below from the Hagley Museum indicates. According to the Hagley Museum in Delaware here is the rest of the story as reproduced from their site info. 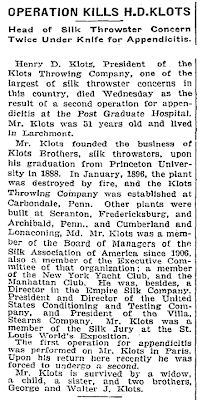 The Klots Throwing Company was incorporated in Pennsylvania in 1894. 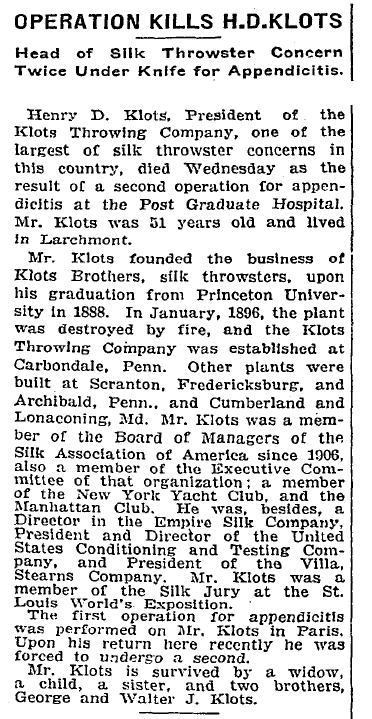 The business had been founded by Henry Durell Klots and George Klots, silk throwsters, in New York City in the 1880s. The expansion of the company was largely the work of Marcus Frieder. Frieder was born in Szinna, Hungary, on February 7, 1860, and demonstrated successful organizational and managerial skills before the age of twenty. In 1890 he emigrated to America and became a bookkeeper for the Klots brothers in New York. The New York mill burned in 1894, and at Frieder's suggestion the business was moved to Carbondale, Pennsylvania. This was part of a general movement of the silk industry into the anthracite and bituminous coal-mining fields, where the wives and daughters of the coal miners formed a large pool of untapped labor. Frieder became manager of the Carbondale mill and later secretary-general manager of the company. On the death of Henry D. Klots in 1914, he succeeded to the presidency. Under Frieder's management, the Klots Throwing Company became one of the larger silk manufacturers in America. 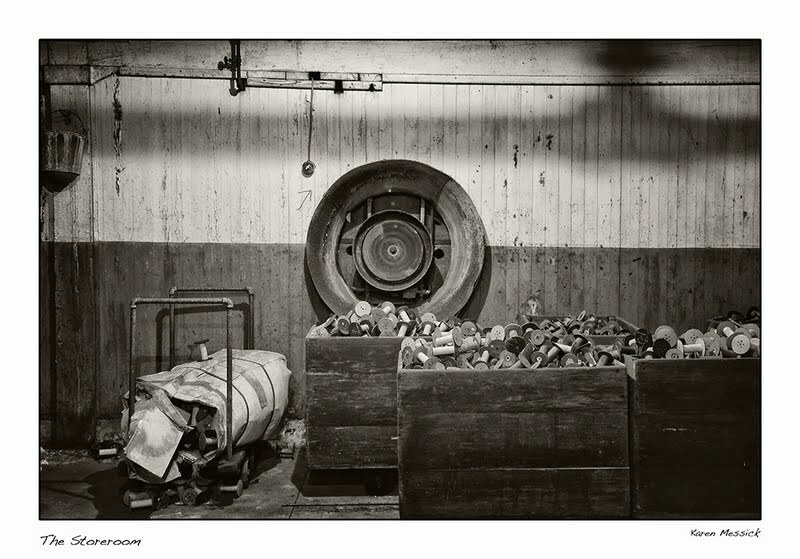 It built additional mills at Archbald, Scranton, and Forest City in the Pennsylvania anthracite region, at Cumberland and Lonaconing in the Maryland bituminous coal fields, and in Virginia and West Virginia. Frieder helped to organize the Villa-Stearns Company, through which he began to import raw silk from China and Japan. He secured full control of Villa-Stearns in 1916 and changed its name to the General Silk Importing Company, Inc. From 1915 to 1921, the firm was the largest American importer and seller of raw silk. Frieder expanded into New England in 1917, when he organized the National Spun Silk Company and built the largest spun silk mill in the United States at New Bedford, Massachusetts. He also acquired the General Fabrics Corporation, with a silk weaving mill in Central Falls, Rhode Island, in 1921 and established the General Silk Dyeing Company in New Bedford in 1926. In January 1927 the General Silk Corporation was formed as a holding and sales company for all of Frieder's operations. At its peak, Klots operated fourteen mills, had 6,000 employees, and annual sales of $50 million. Frieder's business was greatly affected by the rise of rayon as a substitute for silk and, with the collapse of business in the Depression, the firm was forced into bankruptcy in 1932. Marcus Frieder and his son, Leonard Peter Frieder, reorganized the mills at Carbondale, Lonaconing, and Cumberland under the title of General Textile Mills, Inc. As the textile industry migrated southward, the firm absorbed the Hendrick Manufactung Company of Carbondale, a maker of perforated screens and filters founded by Eli E. Hendrick in 1876. General Textile Mills, Inc., was renamed Gentex Corporation in July 1958 to reflect is new product lines. Marcus Frieder died in New York on October 13, 1940. Leonard P. Frieder operated the business until his death in 1972. Great work and research, kiddo! Thanks for posting! I'm heading up there on the 24th to shoot; the directions Herb gave me - left me scratching my head. Is it easy to find? It was a nice surprise to bump into you at the Silk Mill on Wednesday and a pleasure finally to meet you, having enjoyed your work often in the past and having almost met you at Sherwood Gardens on that rainy morning last April. 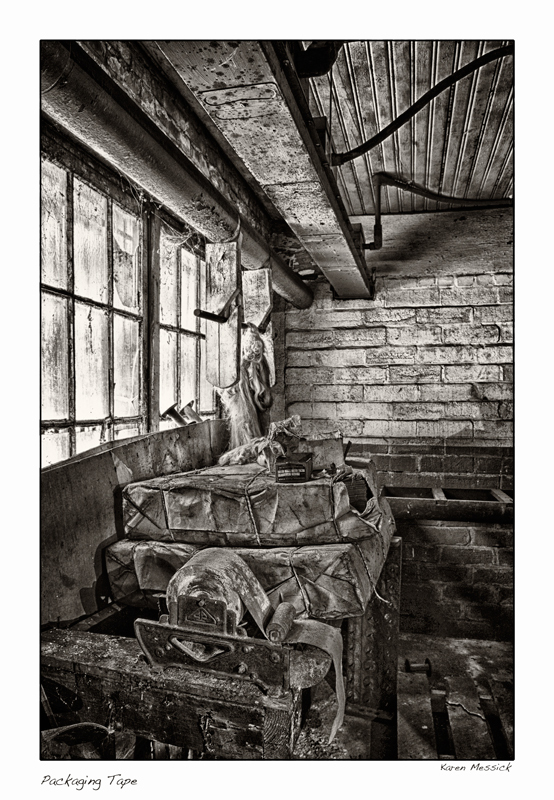 I have thoroughly enjoyed looking at your images from the Silk Mill. Beautiful work! 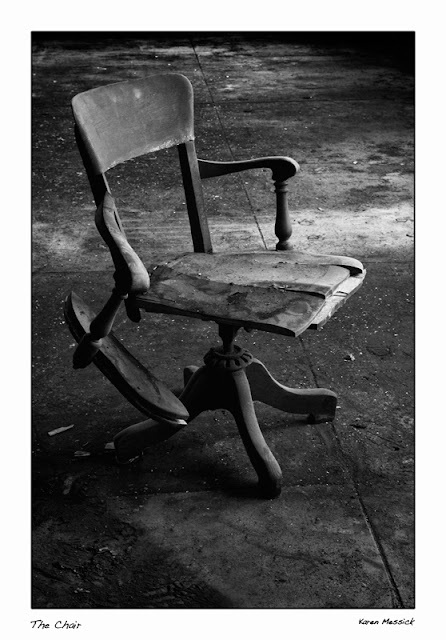 I love your judicious use of B&W. Why thanks Shaun, nice to have met you as well. It was so wet and mildewy in that room this past week I walked right through it. I did make a spool shot in that room the last time with my iPhone. 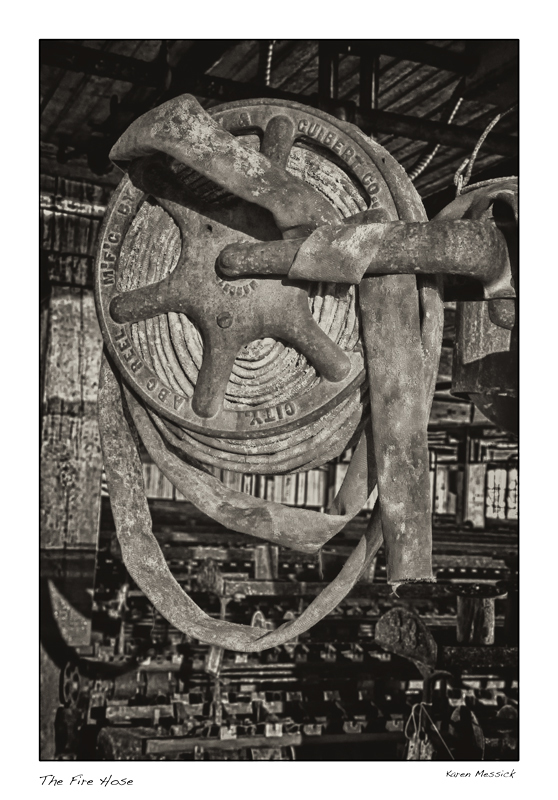 Its a great collection of spools! I will have to shoot that next time with the big camera!